WASHINGTON, D.C. -- Half of Americans approve of the way President Donald Trump is handling the economy, his highest score on nine issues tested in the latest Gallup poll, and the only one that exceeds his overall job approval rating by a significant margin. His worst ratings are on the environment and relations with Russia, which are the only two significantly worse than his overall approval rating. The Aug. 1-12 Gallup poll finds 42% of Americans approving of the job Trump is doing overall. His overall approval rating in the separate Gallup tracking survey for the weeks ending Aug. 5 and Aug. 12 were 41% and 39%, respectively. He has averaged a 48% approval rating for handling the economy thus far in office, which exceeds the combined average 45% economic approval for his five immediate predecessors across their entire terms. Bill Clinton's 57% average economic approval is the highest of presidents since Ronald Reagan, the first president for whom Gallup regularly measured issue approval ratings. On foreign affairs, the other major focus area for all presidents, 39% of Americans currently approve of Trump. He has averaged a 38% approval rating for handling foreign affairs to date, which is substantially worse than the combined 50% average of the past five presidents. Reagan (44%) and Barack Obama (45%) have the lowest foreign affairs approval ratings among these presidents, while George H.W. Bush has the highest, at 63%. Foreign affairs is one of six issues in the poll for which Trump's approval rating is not meaningfully different from his current overall approval rating. The others are the situation with North Korea, gun policy, foreign trade, education and immigration. Six of the issues included in the current survey were also measured in February. Since then, Trump's approval rating for handling the situation with North Korea has increased modestly from 41% to 46%, likely a response to the June summit meeting between Trump and North Korean leader Kim Jong Un. 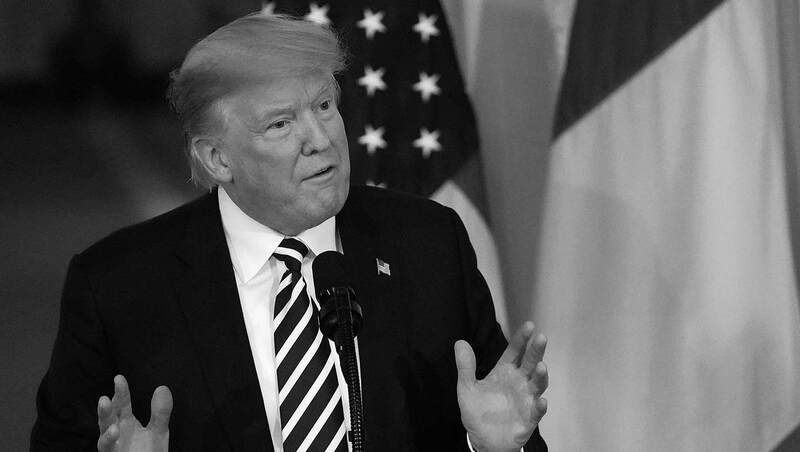 Over the past six months, Trump's approval rating for handling foreign trade has declined significantly, from 46% to 39%, as the administration has engaged in a trade war with China and other countries. Trump's approval on the economy, foreign affairs, immigration and relations with Russia are statistically unchanged since February. Gallup previously asked about Trump's handling of the environment in June 2017, at which time 32% approved, essentially the same as now. The current poll is the first time Gallup has asked Americans to assess Trump's handling of education and gun policy. While Republicans rate Trump more highly than independents and Democrats on all nine issues measured in the poll, the rank order of approval ratings is about the same for all three party groups. Trump gets his highest scores from Republicans, independents and Democrats for the economy. Republicans and independents are least positive about Trump's handling of the environment and Russia. Those two issues tie with immigration as Trump's worst among Democrats. No fewer than 74% of Republicans approve of Trump on any issue, and no fewer than 79% of Democrats disapprove of him, with 90% or higher disapproval from Democrats on four of the nine issues. Half or more of independents disapprove of Trump on each issue, including roughly two-thirds who do so on immigration, the environment and Russia. Consistent with Trump's low overall approval ratings, he receives lackluster ratings from Americans for handling specific issues. The economy is the only one of nine tested in the latest poll for which approval of Trump exceeds disapproval. That issue has been a relative bright spot for Trump, as he governs at a time of a relatively strong economy. So far, Trump's approval on the economy is higher than what recent presidents have typically had. However, Trump's predecessors took office during a U.S. recession (Reagan and Obama) or shortly after one ended (Clinton), or were in office when a U.S. recession began (George H.W. Bush and George W. Bush). With Trump's overall approval rating running close to 10 percentage points below his economic approval rating, it appears other factors are more influential in Americans' assessments of how he is doing. The other factors could be issues like foreign affairs, immigration or trade, on which his approval is closer to his overall approval rating. But they could be non-issue-related, like his personal characteristics, or more simply a result of a Republican president governing in an increasingly politically polarized era. 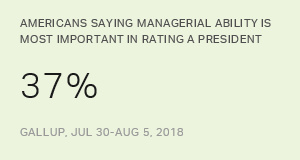 Americans are most likely to say a president's ability to manage the government is the top factor in evaluating his performance, although fewer say this now than in the past.